Majority. In a majority race, the winner has to get at least 50% of the vote. This is the system that SHOULD be called “First Past the Post”, because there is actually a post you have to pass: 50%. This is done using a runoff system, where the candidate with the least votes is eliminated in each round, until one candidate has a majority. This can be done with multiple rounds (with everyone returning to the ballot box for a second or third time), or it can be done ‘instantly’ with a ranked ballot. This is what all of Canada’s major parties use. It’s a great system that eliminates strategic voting, eliminates vote-splitting, and encourages positive campaigning. Heck, it’s even being used now by the Academy Awards. We can do better. 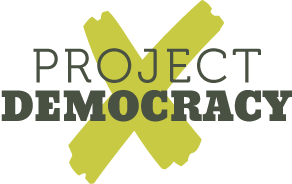 If we combined all the efforts that were invested into Project Democracy, Catch 22, Vote Pair, LeadNow over the last decade, and invested all of that energy into voting reform… we could get Canada talking about real change. Look at Avaaz, for example. They are an international advocacy organization with over eight million of supporters worldwide. A few weeks ago, they produced a video encouraging all their supporters in Canada to vote strategically. But where is the Avaaz video asking Canadians to demand vote reform? Otherwise, we’ll still be having these conversations in twenty years, instead of talking about the real issues. This entry was posted in Better Ballots, Community Organising, First-Past-the-Post is Evil, I Have Too Much Time on my Hands, Random Rants. Bookmark the permalink. Arrow’s impossibility theorem proves that no voting system can fully get rid of strategic voting. And she does this despite the fact that she eats a ham sandwich five days a week, and would rather have the liberal party in power than the animal rights party. What you should say is that strategic voting can be made less central to the “voting game” in other systems. Or Mary just doesn’t vote Liberal at all. I don’t think you would have to rank every party. She could just vote Tory and Greeen if she wants. Or just Tory even. Maybe one small babystep in the right direction would be to at least change the election of individual MPs/MPPs to instant runoff / ranked. At least this is pretty simple to understand and would lead to individual members being elected with a majority of support. Vic, the problem with that is that it tends to concentrate support around the middle. An IRV system for the election of MPs and MPPs would tend to lead to a Liberal majority every time (on the assumption that Conservative supporters like the Liberals better than the NDP and NDP supporters like the Liberals better than the Conservatives). IRV at the riding level, with list seats to make up the balance for each party is probably the best case. The problem with a lot of electoral reform discussion is that it can ironically show a lack of respect for democracy. Too often, “democracy” means “I want a government that agrees with me.” And so we seek political parties the same way we seek beer brands. But a vote is not a consumer choice (and this is why I do not accept the premise of Arrow’s analysis). A functioning democracy will try to represent the priorities of ALL the people within it. And the success of that democracy can be measured by how much it contrasts with any one personal interest. The problem is, if you don’t know what the priorities of your fellow citizens are, this contrast will feel pretty undemocratic. And when all the political parties seem to be seeking the same political real estate, this could mean powerful interests are at work, but it could also mean that they are properly trying to serve the broadest possible base of citizens. It is similar to how gas prices rising and falling simultaneously feels like a conspiracy, but it is also exactly what you would expect in a functioning free marketplace. And so the vague dissatisfaction of atomized voters may not be the best basis for electoral reform. All governments will deal in compromise and negotiation, but the important thing is for people to see that their needs and priorities are being raised and discussed in a fair manner. And so electoral reform should focus on the relationship between people, and not so much the relationship between the people and their government. All parties are coalitions of some sort, but currently we do not know how these coalitions are supported within these parties. We hear rumors about caucus battles between progressive and conservative forces within parties, but we really know nothing about them. A party gets elected on a progressive platform, and then the elected members emerge from caucus with a different set of policies. What happened in there? We don’t know. Proportional Representation might help here by laying bare the negotiations that already take place within political parties. The problem with PR is that “list candidates” will necessarily owe their power to a party and not to a riding and its communities. And that is a pretty big change from our traditions. But local representation has its problems too. There is much that is opaque. Few voters know what takes place within a riding association, and quite often they have no idea why one candidate was offered a party’s nomination and not another. Is the candidate a community leader in a community we are not familiar with? Or are they just party cronies? We don’t know. So why don’t we consider two electoral reforms that don’t require huge changes to our traditions and constitution? 1) Let’s open up caucus discussions to the public. Let the public see how they are being represented not only in Parliament but within their party’s caucus. We will have to sacrifice the delusion of pure party loyalty, but we will gain better insight into how a party decides on its positions. I don’t demand free votes on everything; I understand the need for teams. But we need more caucus transparency. 2) Let’s open up the riding association process. Voters could register with parties for a primary process, so a larger group of voters choose a party’s candidate, and not just the local party elite. However, some voters may not wish to register with any party. In any case, let’s treat party nominations as public business, and not just party business. All riding associations should be required to hold free and open nomination meetings, with defined rules and public oversight. These two reforms might go a long way to assuring the public that their representatives and their government truly represents the priorities of ALL the public. That’s why there are extra seats made for the list candidates. So most of the representatives are representing their ridings, and all ridings still get represented. There are just a few extra people around to even out the playing field. Then the problem, if it is one, is differing status between a list candidate and a local representative. Pierre Trudeau once described MPs as “nobodies” and it is possible that under MMP something similar would happen, with prospective cabinet members all chosen from the list and not from locally-elected MPs, whose job would mainly be to win elections. However, when an associate manager of a campus pub who barely speaks English can become a Quebec MP while campaigning in Las Vegas, it’s tough to defend the sanctity of local representation. Thanks for this. No doubt reform is overdue. You made some great points. At the federal level, where proportional representaton is most needed, the model on the table is that recommended by the Law Commission of Canada. Unlike the model defeated in the Ontario referendum, parties’ nominations to a list would not guarantee nominees a seat. For Toronto’s 22 MPs, for example, there would be 14 larger local ridings, and eight regional MPs to “top-up” the disproportional local results. You vote for your local MP and cast a second vote for your party’s favourite regional candidate. So if a party’s voters win one or two of those eight seats, they’ll be filled by that party’s regional candidates who got the most votes. I agree with your general idea, that many people that say they want democracy but really only want their way and they democracy but I disagree with your reforms. There are reasons why caucus meetings are closed. It’s so that ideas can be shared in a frank way. If caucus meetings are opened, it would just turn into a single party HoC debate, with different sides trying to score points in the debate. Democracy is messy and the closed caucus meeting allows that mess to happen in a way that ideas can be shared easier. I also disagree with this idea of “opening up riding association process” mainly because it isn’t closed now. For 10 bucks, and an hour or two of your time, you can join most parties and have a say in the your local candidate and party leader and president. All we have to do is look south to see how the open riding association works. I believe an open process would led to more middle of the road candidates, instead of candidates that would push issues. It would also make it harder to parties to push equity candidates. I think the idea that Mez puts forward, a ranked list, is a good place to start. It’s easy to understand, not too scary and would be a big move. I know why caucus meetings are closed. I just believe this illusion of party solidarity is pointless. There is no reason why more frank discussions can’t occur in public — perhaps not all, but definitely more. In the U.S. Congress, where party discipline is looser, representatives quite freely criticize their party’s policies, even if usually they ultimately vote with the party. In fact, the hardening of party lines in the U.S. is considered unwelcome and undemocratic partisanship. In the U.S. Congress, of course, patronage runs rampant in a way that would offend Canadian fair-mindedness, so party discipline remains important. But as a voter, I would feel much more comfortable with the Conservatives if I could hear the conversation between progressive and conservative factions in that party (which must surely exist), rather than listen nervously to Stephen Harper and fret about his hidden agendas. And if Stephen Harper knew that small-p progressive Conservative voters could target (or simply not vote for) arch-Conservatives in his caucus, he would be forced to seek the centre. By the way, Jean Crétien’s response to the Liberal nomination wars was to institute his own electoral reform: the parachute candidate. This was intended as a way to ensure more equitable representation, but it also arguably entrenched the power of the party leader, reducing party dynamism further. By the way, I really like Ranked Ballots, which would bring additional dynamism to the electoral process without the potential for vote-splitting. I can also imagine in some cases, two candidates might run for the same party, allowing real voters, and not the local party elite, to decide who would be a better representative. Nice presentation you have here! Not convinced that Arrow is relevant because with preferential balloting people are not choosing between pairs, they are selecting their preferred choice from amongst all candidates, and subsequent choices if their first choice isn’t sufficiently popular. The only problem with preferential balloting is that you will tend to have assemblies with strong majority governments and few if any smaller parties being represented. (This is not a problem severe enough to diminish the idea that electing individual members by majority vote is fundamental to democratic governance.) So we find ways to offset strong majorities and ensure representation from smaller parties. We do that by electing individual members for six year terms but with one-third of the seats contested at fixed, two-year intervals, as is the case with the US Senate. This reduces the party leadership’s power over its caucus and ensures that government is following the path that got it elected in the first place. Ensuring smaller party and possibly independent member representation would require a second ballot where electors would vote for a party rather than a person, and the parties would earn representation proportionally. Federally, the Senate would be elected in this manner and in the provinces and territories a percentage of assembly seats would be set aside for these members. However, given that proportional representation is just as undemocratic as FPTP (although in a different way), these members would have an advisory rather than a legislative role. They would participate in debates and make recommendations but would not have a vote that would affect passage of a bill. This would give these groups the opportunity to make their case for “full” membership in an assembly. Combine these reforms with a clipping of the legislative link with the UK and we would be much closer to true democracy in this country. Excellent summary Mez. Ever since I took politics 101 in university I have thought Mixed Member Proportional is the way we should be going in Canada. It is the perfect balance between party balance and regional representation. 3) until one passes the 50% mark and therefore has a legitimate claim to representing a majority of their constituency. But that’s for single-seat constituencies. 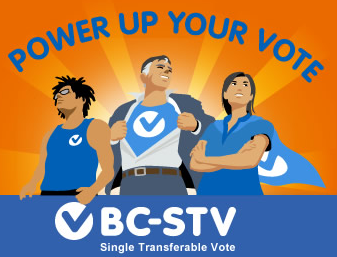 PR-STV is for multi-seat constituencies. The same process of elimination applies except the people who come 2nd, 3rd etc. also get elected to represent that constituency. In Ireland, there’d never be more than 5 MPs (or TDs as we call them) for a constituency, so the top 5 candidates would get elected. I think this is a good system for ensuring representation proportional to the amount of people voting for the different parties, even within the constituencies themselves. It can, like any human-designed system, have its drawbacks though. Parties tend to run more than one candidate in a constituency (why wouldn’t they? In trying to achieve an overall majority?) which can lead to more strategic voting where you just rank the candidates from your favourite party first. But this leads to competition amongst the different candidates within a party, and with candidates with other parties, and what this led to in Ireland was a situation where MPs tried to “outdo” one another by doing favours for local people (getting planning permission for a rich person’s house/business etc.) at the expense of them focusing on national issues. People now feel that led to a culture where MPs weren’t holding Government to account, they were just encroaching on the duties of Local Government, serving their own interests for short-term gain and this is partly what led to our current economic crisis. It also made citizens very insular and focused on affairs in their own community, which strengthens the rural/urban divide and obscures the bigger picture of national politics. People voted on personality rather than policies, without paying any attention to what their political party stood for. This is why until the last election, the two biggest parties were BOTH right-wing, free-market, Catholic conservative parties with 95% identical policies as if somehow things are different when one is Opposition and the other is in Government. It’s also why PR-MMP could be a good way of getting people to think about what parties stand for, since they have an extra vote to pick a political party. On the other hand, I’m not mad about that system because it still involves picking someone who you think is best “on a local level”. I have this one nice, very friendly MP who is very good on local issues but I would never vote for her party. General elections should be about national issues! But that problem depends on how many MPs are in the one constituency. I think PR-STV is the right voting system but we just simply have too many MPs for each constituency. My urban constituency of 100,000 people has 5 MPs. I’d be perfectly happy with 3. It says in our constitution there should be one for every 20,000-30,000 people. I’d raise that to 30,000-40,000 or even 40,000-50,000. With fewer candidates in each constituency it would stop candidates looking over each other’s shoulders like that but still allow smaller parties a chance to get elected. The important thing to remember in these discussions about voting reform is that no system designed by humans is perfect. There are always gonna be drawbacks. Just don’t let any nay-sayers point out the flaws letting ’em feel as if that’s the end of the argument. First-Past-the-Post is a f***ing awful system. It’s drawbacks are too great to carry on with any longer. Good luck. Instant run-off (alternate voting) has the key benefit of not requiring additional MPs or MPPs. With MPs and MPPs voting almost exclusively along party lines, we can’t justify having more of them. Have you ever considerd lumping AV in with the funding equation? So, whoever I vote for first gets my portion of the party funding? Remember, it’s not jsut strategic voting that kills FPTP, but also strategic investing. Why donate to a party I may like if I don’t think they can win? We have to find a clear explanation of voting reform. As it is, the average constituent will dismiss it and a referendum won’t pass (unless we skip the ref and go straight to legislation, which seems so logical); they won’t get it because it’s too complicated. An overview has to include the faults of FPTP and how PR corrects it in a short paragraph. But, leave the different systems of elections for now as it adds so much to the confusion and there will be a place for it when we get to the place where are offered the choice. Mixed-Member Proportional Representation leads to very lazy politicians. Speaking from experience in Australia, 2 states/territories use it Tasmania and ACT and both have economies propped up by public service departments, without which, their unemployment rates would be astronomical. The Senate is also guilty of this. If you have 24 Senators in a Province or 12 Senators in a State, blame and work can be easily shifted, and regions also neglected. However if the Senate is made up of more parties, this issue is sometimes alleviated. FPTP is cleaner, simpler and less subject to fraud, it also forces MPs to campaign and work for their vote.